Bernanke’s argument about inflation isn’t consistent, economist Paul Krugman says. The Fed’s asset-purchase strategy is partially intended to promote maximum unemployment, but some experts are concerned that it will ultimately spark inflation once the recovery takes hold and the system remains awash in liquidity. In this view, there’s a tradeoff between jobs and prices. Bernanke, however, doesn’t take this view: He said in the press conference that core inflation, or, as Krugman says, “inflation inertia,” isn’t a concern — and that expansionary monetary policy doesn’t stoke these forces. The country now has almost 25 million people who are unemployed or underemployed as a result of the Fed’s disastrous policies. Millions of people are losing their homes and tens of millions are losing their life savings. The country is likely to lose more than $6 trillion in output ($20,000 per person) due to the Fed’s inept job performance. The Fed is mandated by law to maximize employment, but focuses on inflation — and “expected inflation” — at the expense of job creation. At its most recent meeting, board members bluntly stated that they feared banks might increase lending, which they worried could lead to inflation. Suffering high unemployment in order to keep inflation low cuts against the Fed’s legal mandate. Or, to put it more bluntly, it may be illegal. In fact, the unemployment situation is getting worse, and many leading economists say that – under Mr. Bernanke’s leadership – America is suffering a permanent destruction of jobs. [We’ve had a] permanent destruction of hundreds of thousands of jobs in industries from housing to finance. Given that the law mandates that the Fed maximize employment, but that unemployment is instead becoming catastrophic under Mr. Bernanke’s watch, how can Mr. Bernanke justify his actions to date? However, the Fed has … been working against all of these goals. We don’t need more stimulus … at least not the kind we’ve had to date, which has only stimulated bonuses for the big banksters and big defense contractors. In truth and in fact, the government’s policies are not only not working to stem the rising tide of unemployment, they are making it worse. Forget the whole “Keynesian” versus “deficit hawk” debate. The real debate is between good and bad policy. The government has committed to give trillions to the financial industry. President Obama’s stimulus bill was $787 billion, which is less than a tenth of the money pledged to the banks and the financial system. The Government Accountability Office says that the $787 billion stimulus package is not being used for stimulus. Instead, the states are in such dire financial straights that the stimulus money is instead being used to “cushion” state budgets, prevent teacher layoffs, make more Medicaid payments and head off other fiscal problems. So even the money which is actually earmarked to help the states stimulate their economies is not being used for that purpose. Critics say those aren’t the types of projects with lasting effects on the economy. “Whether it’s talking about building a new [military] hospital or bachelor’s quarters, there isn’t that return on investment that you’d find on something that increases efficiency like a road or transit project,” said Ellis of Taxpayers for Common Sense. Job creation is another question. A recent survey by the Associated General Contractors of America found that slightly more than one-third of the companies awarded stimulus projects planned to hire new employees. But about one-third of the companies that weren’t awarded stimulus projects also planned to hire new employees. “While the construction portion of the stimulus is having an impact, it is far from delivering its full promise and potential,” said Stephen E. Sandherr, chief executive of the contractors group. It’s unclear how many jobs will be created through the Defense Department projects. Most of the construction jobs are awarded through multiple award contracts, in which the department guarantees a minimum amount of business to certain contractors, and lets only those contractors bid on projects. It’s almost as if the administration is opting for a rose-colored-glasses PR strategy rather than taking a hard-nose look at actual consumer and employment figures and their trends, and modifying its economic policies accordingly. It is a question of focusing any government funding which is made to the majority of poker players – instead of the titans of finance – so that the game can continue. If the hundreds of billions or trillions spent on bailouts had instead been given to ease the burden of consumers, we would have already recovered from the financial crisis. 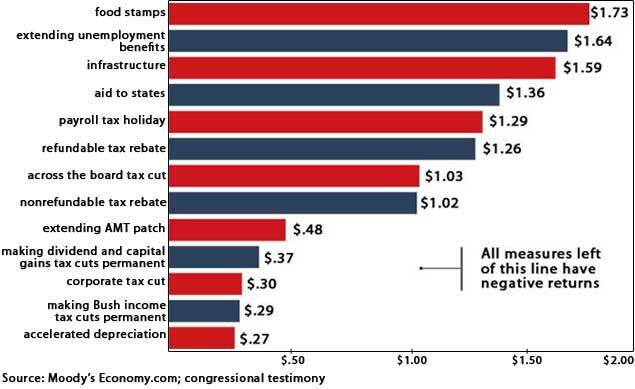 In reality, the entire debate regarding more-versus-less stimulus misses the mark. As painful as it is to think about, the Fed’s policies – like those of the Treasury, White House and Congress – have been geared towards redistributing wealth upwards. See this, this, this, this, this and this.